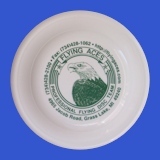 One of the most popular FREESTYLE discs available. This is the disc used by the FLYING ACES in our shows. A popular, inexpensive, all-purpose disc. Great for young tossers and for dogs. Comes with FLYING ACES logo. Excellent fund raiser. Ask us about bulk discounts. Mis-stamps available for $4.00 ea.